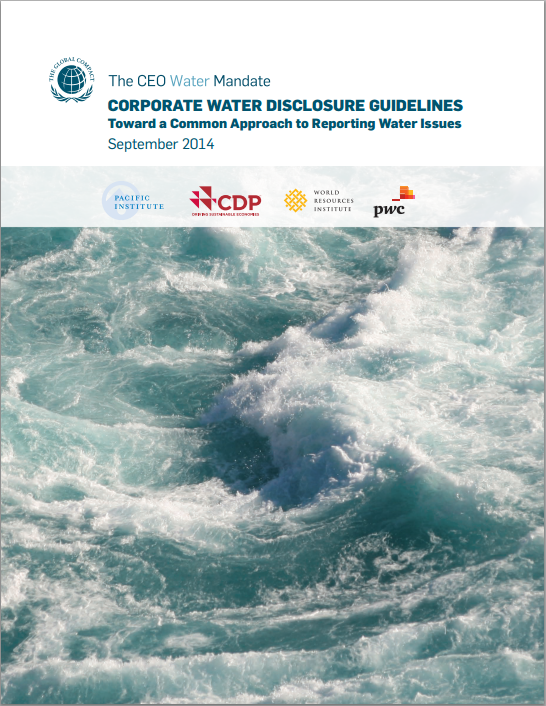 The Corporate Water Disclosure Guidelines are available as a PDF report and web-based tool. This week, the CEO Water Mandate launched its finalized Corporate Water Disclosure Guidelines – a common approach for companies to effectively and intelligibly disclose the many elements of their corporate water management practice to key stakeholders. The Guidelines present an important step in corporate water stewardship that can help companies communicate with their stakeholders, and better understand themselves in the process. Here are a few (of many!) ways in which the Guidelines can benefit a company. By providing meaningful quantitative metrics and qualitative approaches that describe corporate water practice, the Guidelines help companies demonstrate good performance and reduced risks and impacts to investors, consumers, communities, suppliers, their own employees, and others. This is particularly important as, in the past, many companies have used water-related metrics that are at best of only limited use, and at worse quite misleading! For example, traditional globally-aggregated water use metrics inherently hide and undervalue the local nature of water resource challenges. Perhaps a company’s global water use has decreased, but has it decreased in the places that are facing the most urgent water shortages? The Guidelines put forth approaches that capture the local aspects of water performance. They encourage companies to focus more so on their water use in water-scarce and water-stressed areas. Such metrics give us much better insight into when reductions in water use are likely to lead to reduced impacts to people and ecosystems and reduced risk for the company. However, it is important to know that the Guidelines position water use efficiency as but one of a wide menu of actions that demonstrate sustainable corporate water management. The Guidelines also offer insight into how to track and communicate issues related to the provision of water, sanitation, and hygiene (WASH) services in the workplace, regulatory compliance, wastewater treatment, just to name a few. 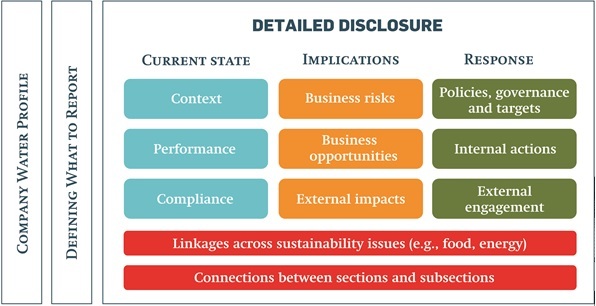 The Corporate Water Disclosure Framework below captures the various types of water-related information companies can report. Those who know about water, know that it is an incredibly complex issue with a variety of interconnected but distinct challenges, such as water scarcity, pollution, governance, infrastructure, access to WASH services, and so forth. Acknowledging that different industry sectors and even different companies within the same industry often face different circumstances and thus water-related challenges, the Guidelines also lay out a process by which companies can understand which water-related topics are most relevant for them and their stakeholders. This assists companies in determining which topics are material to report and thus develop disclosure documents that reflect their story and are of value to their stakeholders. Less time reporting, more time managing! Over the last several years, a proliferation of different water assessment and disclosure metrics and tools has become available. This array of tools has been helpful in many respects, but has also resulted in significant confusion over what is valuable and meaningful to disclose and reporting that is often not comparable from company to company and year to year. The Guidelines development process was iterative and highly-collaborative. Ultimately they were designed to drive alignment among these pieces, rather than add another framework to the fray. CDP, Global Reporting Initiative, PwC, and World Resources Institute – experts in the field of water resources and corporate disclosure – served as strategic partners throughout the three-year development process. In many areas, the Guidelines make use of and build on the great work already put out by these organizations. In others, they have sought to bring these practitioners together to align thinking, for example, on issues like what we actually mean when we say “water stress” and “water risk”. Ultimately, this means companies spend less time reporting and more time actively managing water resources and driving positive change. Develop water management strategies that respond to the specific risks and impacts they face. In this way, the Guidelines serve as guidance not just for disclosure and communication, but also for how companies can effectively track their water performance and advance more sustainable management in their operations and the river basins in which they operate. To learn more about the Guidelines, visit the web-based version at: ceowatermandate.org/disclosure.